This article is about ontology in philosophy. For the concept in information science and computing, see Ontology (information science). Not to be confused with Oncology, Odontology, Ontogeny, or Deontology. Ontology is the philosophical study of being. More broadly, it studies concepts that directly relate to being, in particular becoming, existence, reality, as well as the basic categories of being and their relations. Traditionally listed as a part of the major branch of philosophy known as metaphysics, ontology often deals with questions concerning what entities exist or may be said to exist and how such entities may be grouped, related within a hierarchy, and subdivided according to similarities and differences. The compound word ontology ("study of being") combines onto- (Gr. ὄν, on, gen. ὄντος, ontos, "being; that which is") and -logia (Gr. -λογία, "logical discourse"). See classical compounds for this type of word formation. The first occurrence in English of ontology as recorded by the OED (Oxford English Dictionary, online edition, 2008) came in a work by Gideon Harvey (1636/7–1702): Archelogia philosophica nova; or, New principles of Philosophy. Containing Philosophy in general, Metaphysicks or Ontology, Dynamilogy or a Discourse of Power, Religio Philosophi or Natural Theology, Physicks or Natural philosophy, London, Thomson, 1663. The word was first used in its Latin form by philosophers based on the Latin roots, which themselves are based on the Greek. Leibniz is the only one of the great philosophers of the 17th century to have used the term ontology. Some philosophers, notably in the traditions of the Platonic school, contend that all nouns (including abstract nouns) refer to existent entities. Other philosophers contend that nouns do not always name entities, but that some provide a kind of shorthand for reference to a collection either of objects or of events. In this latter view, mind, instead of referring to an entity, refers to a collection of mental events experienced by a person; society refers to a collection of persons with some shared characteristics, and geometry refers to a collection of specific kinds of intellectual activities. [need quotation to verify] Between these poles of realism and nominalism stand a variety of other positions. "What can be said to exist?" "Into what categories, if any, can we sort existing things?" "What are the meanings of being?" "What are the various modes of being of entities?" Which entities, if any, are fundamental? Do physical properties actually exist? How many levels of existence or ontological levels are there? And what constitutes a "level"? Ontology features in the Samkhya school of Hindu philosophy from the first millennium BCE. The concept of guṇa which describes the three properties (sattva, rajas and tamas) present in differing proportions in all existing things, is a notable concept of this school. In the Greek philosophical tradition, Parmenides (fl. late sixth or early fifth century BCE) was among the first to propose an ontological characterization of the fundamental nature of existence. In the prologue or proem to his poem On Nature he describes two views of existence; initially that nothing comes from nothing, and therefore existence is eternal. Consequently, our opinions about truth must often be false and deceitful. Most of western philosophy — including the fundamental concepts of falsifiability — has emerged from this view. This[which?] posits that existence is what may be conceived of by thought, created, or possessed. Hence, there may be neither void nor vacuum; and true reality neither may come into being nor vanish from existence. Rather, the entirety of creation is eternal, uniform, and immutable, though not infinite (Parmenides characterized its shape as that of a perfect sphere). Parmenides thus posits that change, as perceived in everyday experience, is illusory. Everything that may be apprehended is but one part of a single entity. This idea somewhat anticipates the modern concept of an ultimate grand unification theory that finally describes all of existence in terms of one inter-related sub-atomic reality which applies to everything. The opposite of Parmenides' Eleatic monism is the pluralistic conception of being. In the 5th century BC, Anaxagoras and Leucippus replaced the reality of Being (unique and unchanging) with that of Becoming and therefore by a more fundamental and elementary ontic plurality. This thesis originated in the Hellenic world, stated in two different ways by Anaxagoras and by Leucippus. The first theory dealt with "seeds" (which Aristotle referred to as "homeomeries") of the various substances. The second was the atomistic theory, which dealt with reality as based on the vacuum, the atoms and their intrinsic movement in it. Plato (lived 420s BCE to 348/347 BCE) developed the distinction between true reality and illusion, in arguing that what is real are eternal and unchanging Forms or Ideas (a precursor to universals), of which things experienced in sensation are at best merely copies, and real only in so far as they copy ("partake of") such Forms. In general, Plato presumes that all nouns (e.g., "Beauty") refer to real entities, whether sensible bodies or insensible Forms. 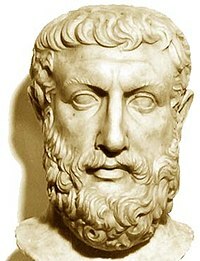 Hence, in The Sophist Plato argues that Being is a Form in which all existent things participate and which they have in common (though it is unclear whether "Being" is intended in the sense of existence, copula, or identity); and argues, against Parmenides, that Forms must exist not only of Being, but also of Negation and of non-Being (or Difference). according to its potency, movement (energy) or finished presence (Metaphysics Book Theta). According to Avicenna (c. 980 – 1037), and in an interpretation of Greek Aristotelian and Platonist ontological doctrines in medieval metaphysics, being is either necessary, contingent qua possible, or impossible. Necessary being is that which cannot but be, since its non-being entails a contradiction. Contingent qua possible being is neither necessary nor impossible for it to be or not to be. It is ontologically neutral, and is brought from potential existing into actual existence by way of a cause that is external to its essence. Its being is borrowed - unlike the necessary existent, which is self-subsisting and is impossible for it not to be. As for the impossible, it necessarily does not exist, and the affirmation of its being is a contradiction. The concept of 'ontological formations' refers to formations of social relations understood as dominant ways of living. Temporal, spatial, corporeal, epistemological and performative relations are taken to be central to understanding a dominant formation. That is, a particular ontological formation is based on how ontological categories of time, space, embodiment, knowing and performing are lived—objectively and subjectively. Different ontological formations include the customary (including the tribal), the traditional, the modern and the postmodern. The concept was first introduced by Paul James' Globalism, Nationalism, Tribalism together with a series of writers including Damian Grenfell and Manfred Steger. In the engaged theory approach, ontological formations are seen as layered and intersecting rather than singular formations. They are 'formations of being'. This approach avoids the usual problems of a Great Divide being posited between the modern and the pre-modern. From a philosophical distinction concerning different formations of being, the concept then provides a way of translating into practical understandings concerning how humans might design cities and communities that live creatively across different ontological formations, for example cities that are not completely dominated by modern valences of spatial configuration. Here the work of Tony Fry is important. René Descartes, with je pense donc je suis or cogito ergo sum or "I think, therefore I am", argued that "the self" is something that we can know exists with epistemological certainty. Descartes argued further that this knowledge could lead to a proof of the certainty of the existence of God, using the ontological argument that had been formulated first by Anselm of Canterbury. Certainty about the existence of "the self" and "the other", however, came under increasing criticism in the 20th century. Sociological theorists, most notably George Herbert Mead and Erving Goffman, saw the Cartesian Other as a "Generalized Other", the imaginary audience that individuals use when thinking about the self. According to Mead, "we do not assume there is a self to begin with. Self is not presupposed as a stuff out of which the world arises. Rather, the self arises in the world". The Cartesian Other was also used by Sigmund Freud, who saw the superego as an abstract regulatory force, and Émile Durkheim who viewed this as a psychologically manifested entity which represented God in society at large. The processes by which bodies related to environments became of great concern, and the idea of being itself became difficult to really define. What did people mean when they said "A is B", "A must be B", "A was B"...? Some linguists advocated dropping the verb "to be" from the English language, leaving "E Prime", supposedly less prone to bad abstractions. Others, mostly philosophers, tried to dig into the word and its usage. Martin Heidegger distinguished human being as existence from the being of things in the world. Heidegger proposes that our way of being human and the way the world is for us are cast historically through a fundamental ontological questioning. These fundamental ontological categories provide the basis for communication in an age: a horizon of unspoken and seemingly unquestionable background meanings, such as human beings understood unquestioningly as subjects and other entities understood unquestioningly as objects. Because these basic ontological meanings both generate and are regenerated in everyday interactions, the locus of our way of being in a historical epoch is the communicative event of language in use. For Heidegger, however, communication in the first place is not among human beings, but language itself shapes up in response to questioning (the inexhaustible meaning of) being. Even the focus of traditional ontology on the 'whatness' or quidditas of beings in their substantial, standing presence can be shifted to pose the question of the 'whoness' of human being itself. Some philosophers suggest that the question of "What is?" is (at least in part) an issue of usage rather than a question about facts. This perspective is conveyed by an analogy made by Donald Davidson: Suppose a person refers to a 'cup' as a 'chair' and makes some comments pertinent to a cup, but uses the word 'chair' consistently throughout instead of 'cup'. One might readily catch on that this person simply calls a 'cup' a 'chair' and the oddity is explained. Analogously, if we find people asserting 'there are' such-and-such, and we do not ourselves think that 'such-and-such' exist, we might conclude that these people are not nuts (Davidson calls this assumption 'charity'), they simply use 'there are' differently than we do. The question of What is? is at least partially a topic in the philosophy of language, and is not entirely about ontology itself. This viewpoint has been expressed by Eli Hirsch. Hirsch interprets Hilary Putnam as asserting that different concepts of "the existence of something" can be correct. This position does not contradict the view that some things do exist, but points out that different 'languages' will have different rules about assigning this property. How to determine the 'fitness' of a 'language' to the world then becomes a subject for investigation. Common to all Indo-European copula languages is the double use of the verb "to be" in both stating that entity X exists ("X is.") as well as stating that X has a property ("X is P"). It is sometimes argued that a third use is also distinct, stating that X is a member of a class ("X is a C"). In other language families these roles may have completely different verbs and are less likely to be confused with one another. For example they might say something like "the car has redness" rather than "the car is red". Hence any discussion of "being" in Indo-European language philosophy may need to make distinctions between these senses. In human geography there are two types of ontology: small "o" which accounts for the practical orientation, describing functions of being a part of the group, thought to oversimplify and ignore key activities. The other "o", or big "O", systematically, logically, and rationally describes the essential characteristics and universal traits. This concept relates closely to Plato's view that the human mind can only perceive a bigger world if they continue to live within the confines of their "caves". However, in spite of the differences, ontology relies on the symbolic agreements among members. That said, ontology is crucial for the axiomatic language frameworks. According to A.N. Whitehead, for ontology, it is useful to distinguish the terms 'reality' and 'actuality'. In this view, an 'actual entity' has a philosophical status of fundamental ontological priority, while a 'real entity' is one which may be actual, or may derive its reality from its logical relation to some actual entity or entities. For example, an occasion in the life of Socrates is an actual entity. But Socrates' being a man does not make 'man' an actual entity, because it refers indeterminately to many actual entities, such as several occasions in the life of Socrates, and also to several occasions in the lives of Alcibiades, and of others. But the notion of man is real; it derives its reality from its reference to those many actual occasions, each of which is an actual entity. An actual occasion is a concrete entity, while terms such as 'man' are abstractions from many concrete relevant entities. According to Whitehead, an actual entity must earn its philosophical status of fundamental ontological priority by satisfying several philosophical criteria, as follows. There is no going behind an actual entity, to find something more fundamental in fact or in efficacy. This criterion is to be regarded as expressing an axiom, or postulated distinguished doctrine. An actual entity must be completely determinate in the sense that there may be no confusion about its identity that would allow it to be confounded with another actual entity. In this sense an actual entity is completely concrete, with no potential to be something other than itself. It is what it is. It is a source of potentiality for the creation of other actual entities, of which it may be said to be a part cause. Likewise it is the concretion or realization of potentialities of other actual entities which are its partial causes. Causation between actual entities is essential to their actuality. Consequently, for Whitehead, each actual entity has its distinct and definite extension in physical Minkowski space, and so is uniquely identifiable. A description in Minkowski space supports descriptions in time and space for particular observers. It is part of the aim of the philosophy of such an ontology as Whitehead's that the actual entities should be all alike, qua actual entities; they should all satisfy a single definite set of well stated ontological criteria of actuality. Whitehead proposed that his notion of an occasion of experience satisfies the criteria for its status as the philosophically preferred definition of an actual entity. From a purely logical point of view, each occasion of experience has in full measure the characters of both objective and subjective reality. Subjectivity and objectivity refer to different aspects of an occasion of experience, and in no way do they exclude each other. Examples of other philosophical proposals or candidates as actual entities, in this view, are Aristotle's 'substances', Leibniz' monads, and Descartes ′res verae' , and the more modern 'states of affairs'. Aristotle's substances, such as Socrates, have behind them as more fundamental the 'primary substances', and in this sense do not satisfy Whitehead's criteria. Whitehead is not happy with Leibniz' monads as actual entities because they are "windowless" and do not cause each other. 'States of affairs' are often not closely defined, often without specific mention of extension in physical Minkowski space; they are therefore not necessarily processes of becoming, but may be as their name suggests, simply static states in some sense. States of affairs are contingent on particulars, and therefore have something behind them. One summary of the Whiteheadian actual entity is that it is a process of becoming. Another summary, referring to its causal linkage to other actual entities, is that it is "all window", in contrast with Leibniz' windowless monads. This view allows philosophical entities other than actual entities to really exist, but not as fundamentally and primarily factual or causally efficacious; they have existence as abstractions, with reality only derived from their reference to actual entities. A Whiteheadian actual entity has a unique and completely definite place and time. Whiteheadian abstractions are not so tightly defined in time and place, and in the extreme, some are timeless and placeless, or 'eternal' entities. All abstractions have logical or conceptual rather than efficacious existence; their lack of definite time does not make them unreal if they refer to actual entities. Whitehead calls this 'the ontological principle'. There is an established and long philosophical history of the concept of atoms as microscopic physical objects.They are far too small to be visible to the naked eye. It was as recent as the nineteenth century that precise estimates of the sizes of putative physical atoms began to become plausible. Almost direct empirical observation of atomic effects was due to the theoretical investigation of Brownian motion by Albert Einstein in the very early twentieth century. But even then, the real existence of atoms was debated by some. Such debate might be labeled 'microcosmic ontology'. Here the word 'microcosm' is used to indicate a physical world of small entities, such as for example atoms. Subatomic particles are usually considered to be much smaller than atoms. Their real or actual existence may be very difficult to demonstrate empirically. A distinction is sometimes drawn between actual and virtual subatomic particles. Reasonably, one may ask, in what sense, if any, do virtual particles exist as physical entities? For atomic and subatomic particles, difficult questions arise, such as do they possess a precise position, or a precise momentum? A question that continues to be controversial is 'to what kind of physical thing, if any, does the quantum mechanical wave function refer?'. The first ontological argument in the Western Christian tradition was proposed by Anselm of Canterbury in his 1078 work Proslogion. Anselm defined God as "that than which nothing greater can be thought", and argued that this being must exist in the mind, even in the mind of the person who denies the existence of God. He suggested that, if the greatest possible being exists in the mind, it must also exist in reality. If it only exists in the mind, then an even greater being must be possible—one which exists both in the mind and in reality. Therefore, this greatest possible being must exist in reality. Seventeenth century French philosopher René Descartes deployed a similar argument. Descartes published several variations of his argument, each of which centred on the idea that God's existence is immediately inferable from a "clear and distinct" idea of a supremely perfect being. In the early eighteenth century, Gottfried Leibniz augmented Descartes' ideas in an attempt to prove that a "supremely perfect" being is a coherent concept. A more recent ontological argument came from Kurt Gödel, who proposed a formal argument for God's existence. Norman Malcolm revived the ontological argument in 1960 when he located a second, stronger ontological argument in Anselm's work; Alvin Plantinga challenged this argument and proposed an alternative, based on modal logic. Attempts have also been made to validate Anselm's proof using an automated theorem prover. Other arguments have been categorised as ontological, including those made by Islamic philosophers Mulla Sadra and Allama Tabatabai. Jaakko Hintikka puts the view that a useful explication of the notion of existence is in the words "one can find", implicitly in some world or universe of discourse. ^ Present tense participle of the verb εἰμί, eimí, i.e. "to be, I am"
^ Michaël Devaux and Marco Lamanna, "The Rise and Early History of the Term Ontology (1606–1730)", Quaestio.Yearbook of the History of the Metaphysics, 9, 2009, pp. 173–208 (on Leibniz pp. 197–198). ^ Griswold, Charles L. (2001). Platonic Writings/Platonic Readings. Penn State Press. p. 237. ISBN 978-0-271-02137-9. ^ a b Isham, C.J. (1995). Lectures on Quantum Theory: Mathematical and Structural Foundations, Imperial College Press, London, ISBN 1-86094-000-5, pp. 63–67. ^ "The archaic ontology of Chändogya Upanisad VI. 2–5, for example, with its emphasis on primordial Being [sat) in its tripartite manifestations as fire (red), water (white), and food (black), correlated with speech, breath, and mind, probably foreshadows the later Sâmkhya ontological notions of prakrti, the three gunas, and the preexistence of the effect." The Encyclopedia of Indian Philosophies, Volume 4: Samkhya, cit. p. 5. ^ "Sample Chapter for Graham, D.W.: Explaining the Cosmos: The Ionian Tradition of Scientific Philosophy". Press.princeton.edu. Retrieved 2017-11-21. ^ "Ancient Atomism (Stanford Encyclopedia of Philosophy)". Plato.stanford.edu. Retrieved 2010-02-21. ^ Lawson, Clive; Latsis, John Spiro; Martins, Nuno, eds. (2007). Contributions to Social Ontology. Routledge Studies in Critical Realism. London: Routledge (published 2013). ISBN 9781136016066. Retrieved 3 Mar 2019. ^ Nader El-Bizri, 'Avicenna and Essentialism, Review of Metaphysics, Vol. 54 (2001), pp. 753–778. ^ James, Paul (2006). Globalism, Nationalism, Tribalism: Bringing Theory Back In —Volume 2 of Towards a Theory of Abstract Community. London: Sage Publications. ^ James, Paul (2014). "Urban Design in the Global South: Ontological Design in Practice". In Tony Fry and Eleni Kalantidou (ed.). Design in the Borderlands. London: Routledge. ^ Barry Smith: Objects and Their Environments: From Aristotle to Ecological Ontology The Life and Motion of SocioEconomic Units (GISDATA 8), London: Taylor and Francis, 2001, 79-97. ^ Heidegger, Martin, On the Way to Language Harper & Row, New York 1971. German edition: Unterwegs zur Sprache Neske, Pfullingen 1959. ^ Carvalko, Joseph (Summer 2005). Introduction to an Ontology of Intellectual Property. The Scitech Lawyer, ABA. ^ Davidson refers to a 'ketch' and a 'yawl'; see p. 18 in Donald Davidson (1974). "On the very idea of a conceptual scheme" (PDF). Proceedings and Address of the American Philosophical Association. 47: 5–20. ^ Uriah Kriegel (2011). "Two defenses of common-sense ontology" (PDF). Dialectica. 65 (2): 177–204. doi:10.1111/j.1746-8361.2011.01262.x. ^ Hirsch, Eli (2011). "Chapter 9: Physical-object ontology, verbal disputes and common sense". Quantifier Variance and Realism: Essays in Metaontology. Oxford University Press. pp. 144–177. ISBN 978-0-19-973211-1. First published as "Physical-Object Ontology, Verbal Disputes, and Common Sense"
^ a b c Hirsch, Eli (2011). "Chapter 5: Quantifier variance and realism". Quantifier Variance and Realism: Essays in Metaontology. Oxford University Press. pp. 68–95. ISBN 978-0-19-973211-1. First published as "Quantifier variance and realism"
^ Whitehead, A.N. (1929). Process and Reality, Cambridge University Press, Cambridge, passim. ^ Armstrong, D.M. (1997). A World of States of Affairs, Cambridge University Press, Cambridge, ISBN 0-521-58064-1, p. 1. ^ Kaiser, D. (1994). Niels Bohr's legacy in contemporary particle physics, pp. 257–268 of Niels Bohr and Contemporary Philosophy, edited by J. Faye, H.J. Folse, Springer, Dordrecht, ISBN 978-90-481-4299-6, Section 4, Questions of ontology and particle physics phenomenology, pp. 262–264. ^ "There are three main periods in the history of ontological arguments. The first was in 11th century, when St. Anselm of Canterbury came up with the first ontological argument." Miroslaw Szatkowski (ed. ), Ontological Proofs Today, Ontos Verlag, 2012, p. 22. ^ Hintikka, J. (1998), Paradigms for Language Theory and Other Essays, Springer Science + Business Media, Dordrecht, ISBN 978-90-481-4930-8, p. 3. Look up ontology in Wiktionary, the free dictionary. "Ontology" . Encyclopædia Britannica. 20 (11th ed.). 1911. p. 118.